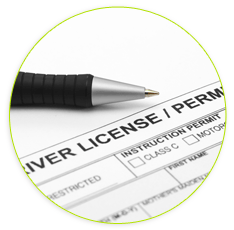 How do I get my California Driving Permit? Driver's Education is the first step in getting your California Driving Permit. Our DMV approved course is self-paced with no timers. If you have not started yet, take a look at the COURSE page. You can view 100% of our course before you decide to buy. If you are ready to get started click ENROLL. There are 11 Lessons with a quick quiz at the end of each lesson. After your final lesson you will see a test button highlighted at the bottom of the COURSE page. Once you submit a passing score you will see a final screen with that score and your shipping address for your DMV certificate of completion. We mail you this certificate, with no shipping cost, within 24 hours and it can take 2-5 business days to arrive. We also email you a confirmation that you passed with all of the next steps to take. We show your shipping address once more along with giving you directions on how to update your information if needed. You Passed this Drivers Ed course - Now what? Review the DMV California Driver Handbook. Remember, all of the test questions are taken from the California Driver Handbook (available online in multiple formats and languages). Links to the California Driver Handbook and the DMV Parent-Teen Training Guide are in the footer of every page in our website. You can also pick up a printed copy at any DMV office. Start reviewing it while you wait for your certificate to arrive in the mail. The handbook contains vital information and may take you a few days to fully study. Before you go to DMV to take your permit test, take these DMV Sample Practice Tests (Regular Driver - Class C) and be prepared for the way the DMV phrases questions. The practice tests are also available in Spanish and American Sign Language (ASL). Once you are at least 15 1/2 years of age, you may take the DMV's written test for your permit. You will need to make a DMV appointment for the written test. We recommend that you wait until you have your certificate in hand before making an appointment to avoid rescheduling. Tests are not given after 4:30pm. Make a DMV appointment by phone: 1-800-777-0133 or online (select the office visit appointment option). The DMV has changed the requirements recently due to the REAL ID Act. Please check DMV.CA.GOV for the latest under 18 application requirements. Fill out or bring a completed DL44 application and have both parents sign it (available at DMV offices or complete the electronic DL44 application online ahead of time). Pay the DMV application fee, this fee pays for both your permit and your driver's license. Take a vision test - if you wear glasses, bring them. Pass the written test. You have three chances to pass the test. If you fail, you must wait seven days before taking the test again. Remember, questions for this test are taken from the California Driver Handbook. See the complete DMV under 18 checklist for current requirements. They will ask for these at the appointment window. If you don't have them, you won't get past the window! You will also need to pay the DMV fee and have your picture taken, and give a thumbprint. Once you pass your written test, you will be issued a provisional permit. A parent, guardian, spouse or adult 25 years of age or older, who has a valid California driver license, must be with you when you drive. He or she must sit in a position close enough to take control of the vehicle. It is illegal for you to drive alone at any time. If you did NOT pass the California Driving Permit test (the written test at the DMV) on your first try, please look at your application. You will see TWO different dates below your name. One says DATE ISSUED and the other says EXPIRATION DATE. You have ONE YEAR to complete the process of getting your permit AND your license, and the clock starts ticking from the day you pay the fee and submit the application. If the 6-month waiting period is beyond the EXPIRATION DATE, you will have to re-take the written test, pay another fee, and get another permit. PERMITS ARE NOT RENEWABLE. IMPORTANT NOTE: You are required to keep your permit a minimum of 6 months, irrespective of when you turn 16. If you are already 16, you must still keep the permit for 6 months before you will be eligible for the driving test.